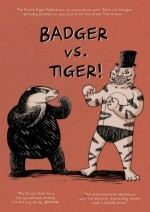 * Andy Oliver on Badger Vs. Tiger!. * here's a reprint of an essay about The Cat, an early '70s attempt by Marvel to present a superhero to an audience that was at least cognizant of second-wave feminism. * this glorious photo of the late actor Martin Landau as a young cartoonist is one of the better photos of its type ever, now making the rounds in tributes. * this is pretty adorable. * Jeffrey Kindley talks to Grant Snider. I love the straight-forward contest-setting declaration of the headline. * finally: one more Bob Mankoff article.